"Solfatara" redirects here. For the volcanic crater in Italy, see Solfatara (volcano). Look up fumarole in Wiktionary, the free dictionary. A fumarole (or fumerole – the word ultimately comes from the Latin fumus, "smoke") is an opening in a planet's crust which emits steam and gases such as carbon dioxide, sulfur dioxide, hydrogen chloride, and hydrogen sulfide. The steam forms when superheated water condenses as its pressure drops when it emerges from the ground. 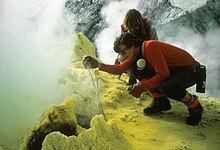 The name solfatara (from the Italian solfo, "sulfur") is given to fumaroles that emit sulfurous gases. Fumaroles may occur along tiny cracks, along long fissure, or in chaotic clusters or fields. They also occur on the surface of lava or pyroclastic flows. A fumarole field is an area of thermal springs and gas vents where shallow magma or hot igneous rocks release gases or interact with groundwater. When they occur in freezing environments, fumaroles may cause fumarolic ice towers. Fumaroles may persist for decades or centuries if located above a persistent heat source; or they may disappear within weeks to months if they occur atop a fresh volcanic deposit that quickly cools. The Valley of Ten Thousand Smokes, for example, was formed during the 1912 eruption of Novarupta in Alaska. Initially, thousands of fumaroles occurred in the cooling ash from the eruption, but over time most of them have become extinct. An estimated four thousand fumaroles exist within the boundaries of Yellowstone National Park in the United States. In April 2006 fumarole emissions killed three ski-patrol workers east of Chair 3 at Mammoth Mountain Ski Area in California. The workers were overpowered by toxic fumes (a mazuku) that had accumulated in a crevasse they had fallen into. Another example is an array of fumaroles in the Valley of Desolation in Morne Trois Pitons National Park in Dominica. The formation called Home Plate at Gusev Crater on Mars, which was examined by the Mars Exploration Rover (MER) Spirit, is suspected to be the eroded remains of an ancient and extinct fumarole. This article incorporates public domain material from the United States Geological Survey document: "Fumarole". USGS Photo Glossary. Retrieved 2019-02-06. ^ Neuendorf, Klaus K. E. (2005). Jackson, Julia A.; Mehl, James P.; Neuendorf, Klaus K. E., eds. Glossary of Geology. Springer Science & Business Media. p. 257. ISBN 9780922152766. Retrieved 2015-06-06. fumarole field[:] A group of cool fumaroles. ^ Hymon, Steve; Covarrubias, Amanda (2006-04-09). "How Routine Turned to Tragedy at Mammoth". Los Angeles Times. Retrieved 2011-05-09. Wikimedia Commons has media related to Fumaroles. Chisholm, Hugh, ed. (1911). "Fumarole" . Encyclopædia Britannica. 11 (11th ed.). Cambridge University Press. pp. 300–301.